I was physically, emotionally, and sexually abused for six years as a child by my family’s live-in nanny, Waldina. My parents had no idea. They hired her when I was ten. She came from an agency and had good references … but we all came to learn that no background check or gate of a private community could keep me safe from the monster living in my own home. My dark road of daily abuse began when Waldina put her tongue in my mouth to scold me for chewing my gum too loudly. They say that in a moment of crisis or trauma, you are likely to develop one of three reactions: fight, flight, or freeze. No background check or gate of a private community could keep me safe from the monster living in my own home. I froze. And, like so many other children and adults, I spent years replaying the moment in my head, feeling guilty and at fault—ashamed of my normal reaction to a completely abnormal situation. Why didn’t I run? Why didn’t I yell? Why couldn’t I just do something? But at ten years old, I was unable to comprehend what had just happened. For the next few days, I was rendered voiceless by feelings of embarrassment, confusion, and fear. Once Waldina realized I hadn’t told anyone about what had happened, and that I likely was not going to tell, the abuse escalated—quickly. The sexual abuse became overt and explicit, and she would physically terrorize me to ensure my silence. I was thrown down a flight of stairs. She put forks and lighters inside me, causing permanent damage. In the name of survival, my brain and body developed their own ways of coping with the trauma. In moments of coercion or violence, I’d dissociate. I learned the exact pattern of the wallpaper and carpet in rooms where I was abused. I can still remember the tile pattern from the day I was beaten within an inch of unconsciousness, lying motionless on the bathroom floor. I also compartmentalized my personality. There was the Lauren who went to school and excelled in her classes. There was another Lauren who was the big sister and protector for my younger siblings. And there was a third Lauren who was Waldina’s girlfriend, play toy, or punching bag—depending on the day, or the hour. Today, I am not a victim. I am a thriving survivor. But I know that I will be recovering for the rest of my life. My abuse went on every day for six years, until I told a counselor when I was in high school. I was immediately believed and supported. Waldina fled our home and was found in Oklahoma coaching ten-year-old girls in soccer. We took her to court, which was both empowering and revictimizing, all at the same time. Waldina is now serving a twenty-five-year sentence in a North Florida prison, unable to harm others as she harmed me. Today, I am not a victim. I am a thriving survivor. But I know that I will be recovering for the rest of my life. The early days of recovery were the worst. I had PTSD (to some extent, I still do). I developed anorexia and insomnia. I felt guilty and ashamed. I’d come home from school every day and cry. It took a huge amount of work to climb out from that dark hole. I spent a lot of time with a trauma-focused therapist, who gave me a safe way to process what happened and move beyond it. Senator Lauren Book, M.S. Ed, is an internationally respected and renowned child advocate, former classroom teacher and best-selling author. She represents the Broward County-based District 32 in the Florida Senate, and is a member of the Florida Children and Youth Cabinet. 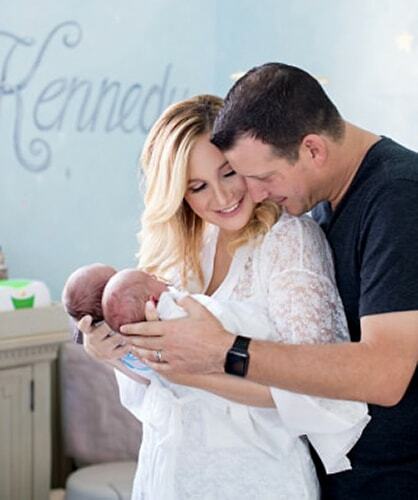 Lauren enjoys spending time with her family – husband, Blair Byrnes, and two newborn twins, Kennedy Grace and Hudson Lee – and leading her Florida-based nonprofit Lauren’s Kids (www.laurenskids.org). She is the recipient of a Congressional Medal of Merit for her tireless work to protect childhood, and an EMMY and Gracie Award-winning television producer who has been featured by national media outlets including Newsweek, Cosmopolitan Magazine, the Huffington Post, USA Today and many more.